The ViewSonic XG240R checks all the boxes for a solid gaming monitor at an affordable price. High refresh rate used to be a premium feature, reserved for those with budgets to afford powerhouse gaming rigs. But these days, it’s a feature we see pop up in more affordable options too. 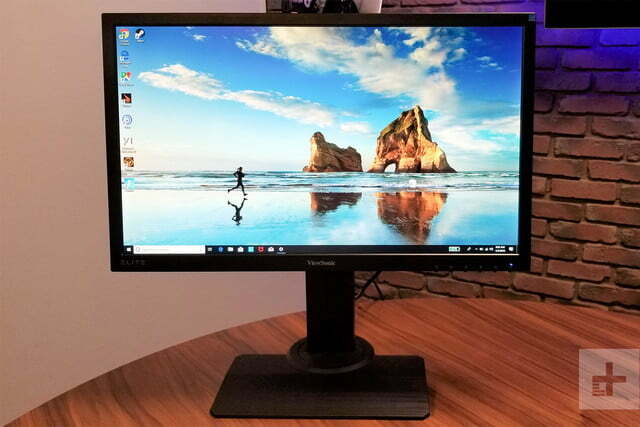 Priced at $273, the ViewSonic XG240R is a great example. It’s a 24-inch full HD monitor with a TN panel that packs in everything a gaming enthusiast will need, but without breaking the bank. With features like RGB lighting on the back panel, support for AMD FreeSync Technology, a 144Hz refresh rate, the XG240R really manages to impress for its price. Right out of the box, the ViewSonic XG240R is rather low key. It keeps a plastic design, with thick bezels that wrap around the corners of the display. The base is also similar, featuring a clean and brushed plastic finish. If you want high-end build quality and materials, you’ll have to look elsewhere. In a matte-black color, it looks like something that belongs in an office, rather than a gaming setup. Still, that’s not a bad thing, as the plastic design is sturdy. Weighing in at roughly 14 pounds, the monitor is built like a tank, but is surprisingly easy to carry about. We also didn’t notice any flexing or bending when pressing on its sides. Ergonomics add up well, as the monitor can fully rotate to a side 90-degree vertical angle with little ease — common with most monitors like the Asus ROG Swift PG27UQ. It also is VESA certified, so set up is quick, with the column snapping right into the back and securing easily into the base with a single screw. It can tilt forward five degrees and back 20 degrees, swivel to the left and right up to 45 degrees, as well as some decent height adjustment of 120 mm. Once turned on, however, the ViewSonic XG240R dazzles. On the rear back panel of the device are two lighted areas shaped in the form of arrowheads which, by default, shift into a spectrum colors. You can customize the lighting, and have it sync up with Razer Chroma, Thermaltake, and Cooler Master peripherals. Once turned on, the ViewSonic XG240R dazzles. Unfortunately, because the XG240R does not have its own software, Cooler Master’s Masterplus+ is the default program for customization and doesn’t require additional peripherals to set up. Getting the software for customizing with other peripherals from Razer or Thermaltake will also require a separate download. As for speakers, the 2 x 2 watt down-firing speakers don’t provide quality. It is built in and in line at the bottom sides of the display. While that sounds like the ideal position that could bring audio towards your face, we wouldn’t recommend depending on it. Even when volume was turned up to 100 percent, we struggled to hear conversations during the cutscenes in Battlefield V. We instead recommend you buy extra speakers or headphones if you want a truly immersive audio experience with this monitor. 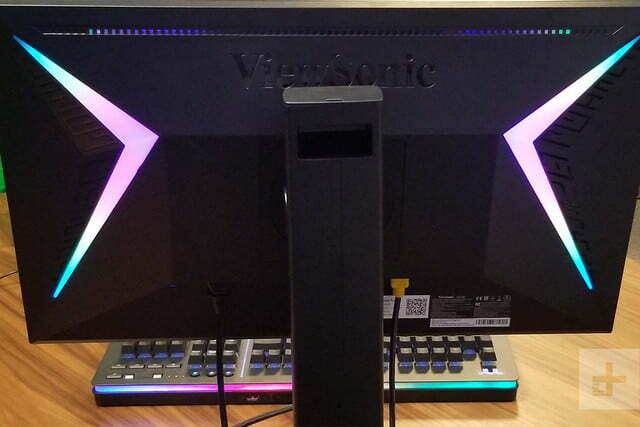 Like most modern monitors, the ports on the ViewSonic XG24OR are downward firing. Sadly, there is no panel covering the ports — or a way to manage the cables. 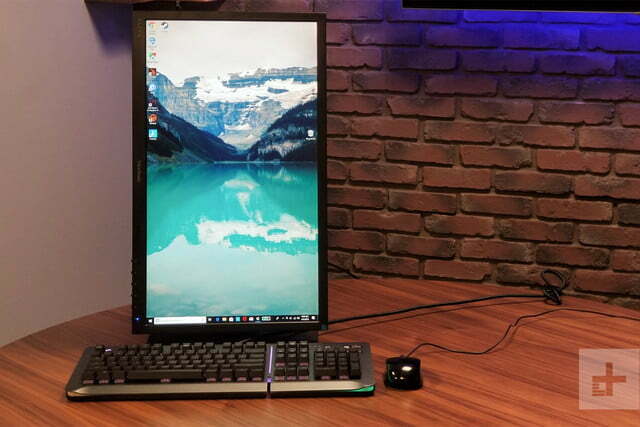 This leaves the mess of wires exposed if the monitor is sitting on a desk. Still, the selection of ports is generous. It includes one DisplayPort, and two HDMI for display output. There’s no USB-C, which has not yet made its way to gaming monitors. Instead, on the left side, there is a selection of two USB-A 3.0 ports for peripherals and charging. There’s also an extra USB-B 3.0 port in the same underside area for good measure. Compared to premium monitors like the Alienware AW3418DW, this connectivity is the norm. However, with competing budget monitors like the Asus V245H, the additional USB ports are a nice addition. 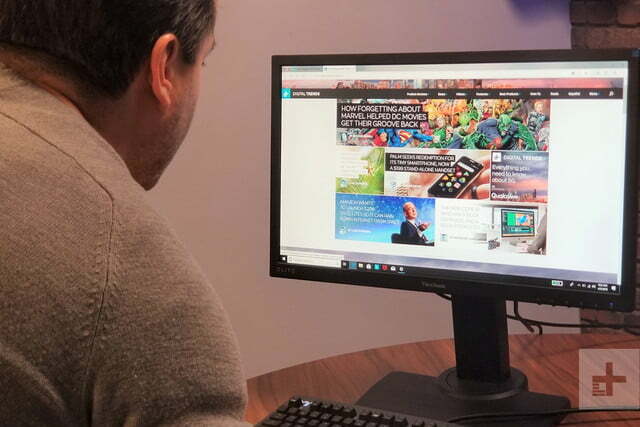 Controls are important on a monitor, and when compared to a premium option like the Acer Predator XB3, the ViewSonic XG240R keeps things a bit simple. There is no fancy joystick — just a series of six buttons located on the bottom right side front of the display in plain view. The buttons are very tactile and create a satisfying clicking noise when pressed. On screen cues will even help you see which button accomplishes menus task, but the buttons aren’t clearly labeled from the front. One press of the “G” button brings up quick toggles to switch between color modes. Pressing on any one of the other five buttons will bring up the main menu. From there, you can get a quick glance at all important information, including the refresh rate, input, and the status of FreeSync and Elite RGB. Unfortunately, the options for changing brightness, contrast, are hidden beneath the menus. Changing these will require pressing a series four different buttons. I would have preferred quick settings for these options, rather than quick toggles for color profiles. When gaming on newer RTX-powered laptops like the Legion Y740, we easily were able to push out high frame rates. The same power also applies to the ViewSonic XG240R. When we hooked up our Legion system to the monitor, we received nearly identical 100 FPS in most games like Battlefield V and Civilization VI, mainly thanks to the 144Hz panel and 1ms response time. That fast refresh rate really pays off. The games looked great too. Toggled to the pre-set First-Person Shooter Mode, and with Battlefield V, we were able to notice rich green colors of grass. We also noticed extra detail in silver and black colors when looking through the scopes of a gun. With the ViewSonic XG240R starting at $273, it all comes down to price. Switching to the pre-set MOBA and Battle Royale mode also created a similar experience. The colors of the miniature RC cars in Rocket League popped against the plain background of the arena. To the naked eye, both modes also make images brighter and create a richer and deeper look. Interestingly, the monitor sports 22-level black stabilization. This provides a heightened visibility and detail by brightening dark scenes. A total of 22 customizable levels of black stabilization controls are available from within the menu. We tried it out with a nighttime mission in Assassin’s Creed Odyssey, and in a completely dark room, we really noticed scenes becoming a bit brighter than when the setting was toggled off. Sadly, despite the colors, tilting the monitor around creates a noticeable glare. The 170 degree horizontal and 160 degree vertical viewing angles are not the best. That’s largely in part due to ViewSonic’s use of a TN panel. While TN panels offer faster response times, and higher contrast ratios, more expensive monitors like the LG 27UK650 often feature IPS panels. 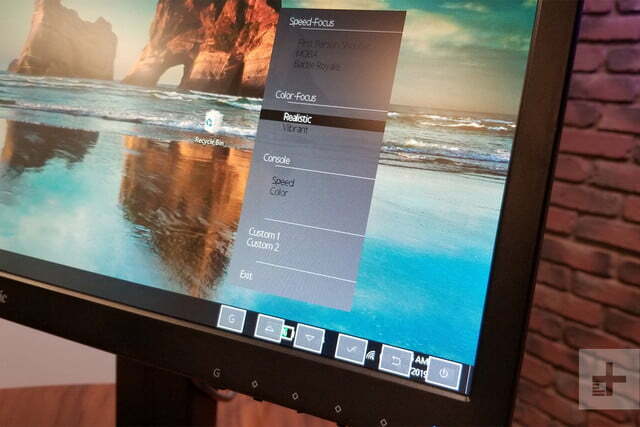 Compared to TN counterparts, IPS panels generate accurate colors and wider viewing angles. Unfortunately, it is also expensive, as best seen with a $379 monitor like the Acer Predator XB1. It’s a shame, but with the ViewSonic XG240R starting at $273, it all comes down to price. Additionally, while the ViewSonic XG240R supports AMD FreeSync for lag-free gaming, we couldn’t test it in our laptop with Nvidia’s RTX 2070 Max-Q graphics. The feature is instead for laptops with AMD’s graphics cards. It remains a feature in most budget gaming monitors like the BenQ EL2870U as well as the Asus VG245H. On the more technical side, this monitor is good for productivity as well. Despite its average 1080p screen resolution, contrast ratios were rated at 960, putting it close to the 1,000 range we typically look for. It also gets very bright, at 350 nits, which again falls behind premium monitors. As for color gamut, it comes in with a rating at 1.8. Adobe RGB comes in at 72 percent, alongside a sRGB rating of 98 percent. That means images will look natural. It might be lacking HDR support or a 4K resolution, but this monitor has colors where it counts. 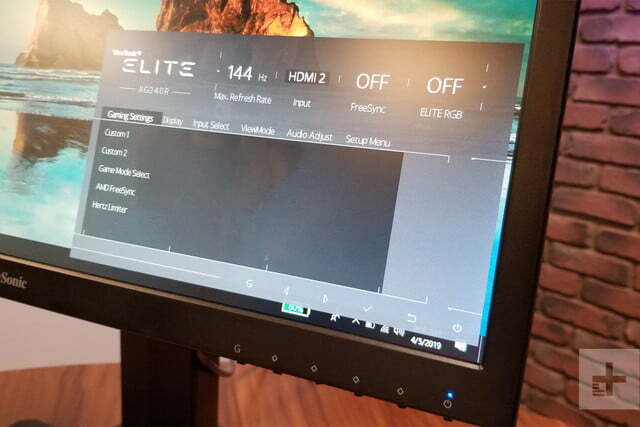 After initial testing, we put the monitor our post calibration tests with the Spyder 5 Elite software. The improvements were subtle, and visual quality remained the same. The only difference we saw in our post testing is a slightly lower average color ratio of 1.6, and an increased contrast ratio of 980. There’s no real hidden potential in this monitor, and to confirm it we watched some movies and TV shows. When viewing The Simpsons Movie, the post calibration experience was still pleasing. Yellows in Homer Simpson’s skin seemed especially vibrant. Switching to a darker movie like i, Robot, visuals still popped, and we noticed the shine in the bodies of the white colored robots. That said, calibration is not necessarily needed with this monitor out of the box. If you need a gaming monitor and are you a budget, then the ViewSonic XG240R is for you. It comes with enough that you need for gaming, with bonuses like RGB lighting, and support for AMD Freesync. Only dull speakers, thick bezels hold it back from being perfect. There are plenty of great budget gaming monitors in the market, and the ViewSonic XG240R is not the cheapest of the bunch. A top alternative is the $189 Asus VG245H which packs in similar resolution, response times, FreeSync support, but no RGB lighting and is limited to a 75Hz refresh rate. Other alternatives include the $296 27-inch Asus VG278Q, or the $200 24-inch AOC G2460PF which comes with the same 144Hz refresh rate as the ViewSonic XG240R, but sans the RGB. At the very top is the BenQ EL287OU. While a bit more expensive at $400, it comes in with a 4K resolution and the addition of HDR support. ViewSonic offers a three-year limited warranty on parts, labor, and backlighting on the ViewSonic XG240R. That means it should stand the test of time. Yes. If you’re on a budget and not willing to spend more than $300 on a gaming monitor, this ViewSonic monitor is a good option.